Tonight I'm venturing into new, uncharted territory with my very first Pét-Nat! 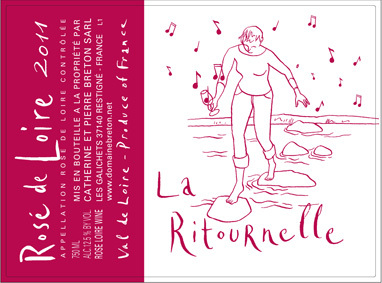 This category of pétillant naturel (naturally sparkling) wine is made by bottling unfinished, still fermenting wine. Then, as the wine finishes its fermentation, the bubbles produced (remember, the products of alcoholic fermentation are booze, carbon dioxide, and heat!) are captured and go into solution. As you can see, the yeast and other sediment is then collect at the bottom of the bottle. No filtration here! This Pierre Breton Pét-Nat comes from the Anjou region of the Loire Valley. It's made entirely from hand harvested Cabernet Franc, using indigenous yeasts, and low levels of sulfur. I found this beauty at Astor Wines & Spirits in New York last year, where it came highly recommended. I wasn't sure what to think of the cloudy nature of the wine, but thought it would be worth the experiment! Review: This wine is a slightly cloudy pink salmon color, with just a hint of spritz, and light aromas of earth and cranberry. 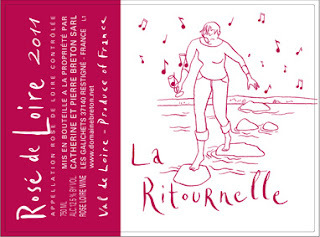 On the palate La Ritournelle is slightly off dry, with a bright, fresh acidity. Savory flavors of earth, farmyard, and dried herbs dominate, with tart dried cherry and cranberry rounding out the palate. The finish is moderate, with the fruit emerging a bit more at the end. Food Pairing: I paired with savory glass of goodness with spicy meatloaf. The acidity cuts through the richness, and the dried herbal note complements the spice and herbs in the loaf. Yum. Bottom Line: This won't replace the other bubbles in my life, but I did enjoy! Review: This Clouet is a pale gold color with vivid aromas of ripe pale apples, Asian pears, mineral, and toasty brioche. The palate is dry with bright acid, a finely beaded mousse, and creamy round texture. The orchard fruit is complemented ripe strawberry, hazelnuts, minerals, and a super duper hit of autolysis (yeast, toast, pastry). The finish is long and lingering. Food Pairing: I served with with homemade pâté de campagne and a fresh baguette. Bottom Line: The rich texture and flavor development on this wine are just fantastic. I wish I'd bought two! I got some amazing news today! After more than two years of study (including 4 tasting exams, 5 theory exams, and 2 intense papers), I have finally gotten word that I am WSET Diploma Graduate! If that doesn't call for bubbles, I don't know what does! Tonight I opened a gorgeous California sparkler from the Sta. Rita Hills AVA within the Santa Ynez region. Sea Smoke is known for some of the most exciting California Pinot Noir in the market, and their Blanc de Noirs certainly lives up to the hype. This L.D. (late disgorged) bubbly is all about toast and autolysis. This wine spends time in oak (toast! ), as well as extended time "sur lie" where it picks up deliciously rich bready, yeastiness (autolysis!) After the initial fermentation, the wine spends nine months ageing on the lees (spent yeast cells), and then another 24 months on the lees inside the bottle after the second fermentation prior to disgorgement. The wine is then treated with a zero dosage (no sugar) liqueur d'expedition, maintaining the wine's dry, zippy character. Sounds good to me -- let's taste! Review: The Sea Spray is a pale salmon color with a finely beaded mousse and aromas of dried quince, toasted almonds, and fresh brioche. The palate is bone dry with amazingly bright acid, creamy bubbles, and a round texture. The flavor intensity is off the charts: toasted oak, toasty pastry, mineral, soft golden apples, and green plum. The finish is long and lingering. Food Pairing: Amazing by itself, but the Sea Spray would be a perfect match for fresh, sweet oysters. Bottom Line: I don't have enough words for how much I love these bubbles. The texture, the rich flavors, the bright acid, the freshness. Just outstanding. Where did I get it? 'Twas a Gift!